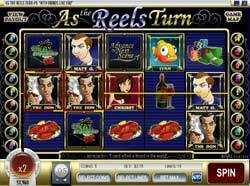 As the Reels Turn is a five reel slot with a story and we call these games "i-Slots". In an i-Slot the more you play the more of the story you see. You can replay past scenes at any time by going to the Game Map which you access by clicking 'Game Map' in the upper-right corner of the game. Click on any scene and it will replay for you. If 3 or more Ivan the Fish Icons appear on any of the 5 Reels, you will receive 10 Free Spin at 3 times Multiplier. If 3 or more scattered Bonus Icons appear on any of the 5 Reels, you will enter the Counterfeit Chips Bonus Round. In this Bonus Round you will click on the different Casino Chips until you hit a Fake Chip. The values of the winning chips will accumulate for a final payout. To activate this bonus game you need to hit 3 or more scattered Tommy Wong symbols. In the Tommy Wong bonus round you must choose a Tommy Wong character that you think the audience will like the most. If 3 or more Advance to Next Scene Icons appear on any of the 5 Reels, you will then be shown a Cut-Scene. You can view the various stages in As the Reels Turn by clicking on the Game Map. There will be surprise Bonus Rounds after some of the cut-scenes.